I always chuckle when I see King of Tokyo (with the Power Up expansion), Zooloretto, and Takenoko tossed out as recommendations for good gateway games. Not because they aren’t good gateway games (they are), but because there’s almost always a comment to the effect of, “Pandas make everything better/more tolerable for non-gamers.” It’s assumed that if you throw in a cute panda, people will want to play the game. But is this the case with the poker variant that is Pandante? Read on to find out. Breakfast. (This phase does not occur on the first gambit.) You may buy a new hand for two gold. Ante. Each player throws one gold into the pot. The Splash. Deal three community cards face up in the center of the table. Each player then bets by placing two gold on the hand they are claiming to have. Be aware that if you choose to claim a high hand you cannot go back and lower your claim later. After everyone has placed their bets, you can pay to draw a new card and then discard a card from your hand. (This is called Snacks and is optional.) The price of Snacks is two gold per space below the highest hand. So, for example, if you are claiming to have a Straight (which is three) and your opponent claims to have a Floosh (which is 5), you will have to pay 4 gold for snacks. Snacks are free for those with the highest claimed hand. The Paws. The fourth community card is dealt face up to the table, followed by another betting and Snacks round, which operate just like they did in The Splash. The one difference is that you may now choose to fold if you’d rather not bet. If you fold, though, you’re out of the game for the rest of the gambit and you cannot challenge other players. The Tail. The fifth community card is dealt face up to the table, then there is another betting round and you may choose to bet or fold. There are no Snacks in this phase. After everyone bets, each player has the chance to play up to two special abilities. You are entitled to play any special ability which matches a card in your hand. However, you can lie about what you have in your hand to try to get a more useful ability. Players can challenge you, however, and if you can’t or won’t prove that you are entitled to that ability, you don’t get to use the ability and you have to pay your challengers five gold each. If you can prove that you were entitled to that ability, your challengers each have to pay you five gold. Once all the phases are complete, the gambit’s winner is determined. The winner is the person who has the highest claimed hand who either didn’t lie or wasn’t challenged. No one has to prove they have what they say, unless other players challenge the highest claim. If you are challenged and lied, you can fold and pay each challenger five gold. If you can prove you’re telling the truth, each challenger has to pay you five gold times the number of players in the game. If the person claiming the highest hand lied, was challenged, and couldn’t prove it, move to the next highest claimed hand to determine the winner. The winner takes the pot, which is all the money in the center of the table, as well as what is on other player’s boards. 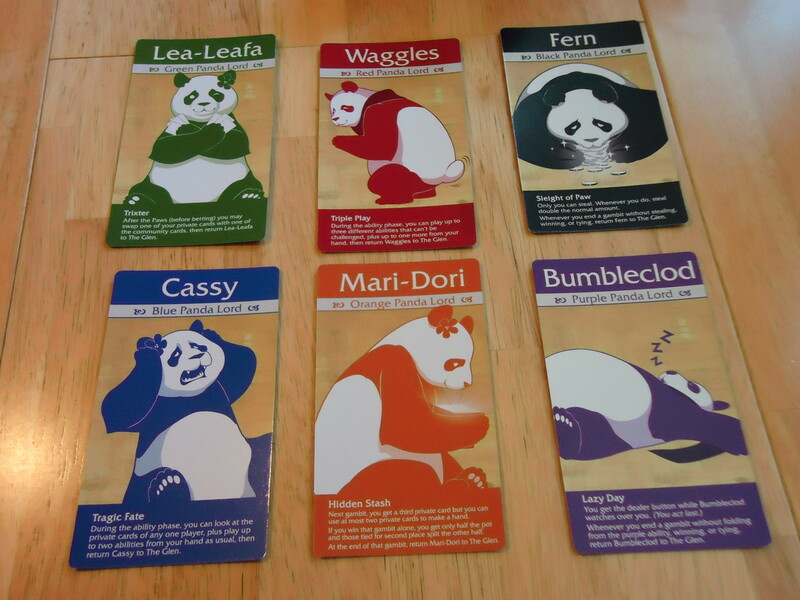 Additionally, there are Panda Lord cards which can aid you in crafting a better hand or messing with your opponents. You win a Panda Lord by successfully lying and winning a gambit. Each Panda Lord conveys a special ability that you can use at various points in the game. 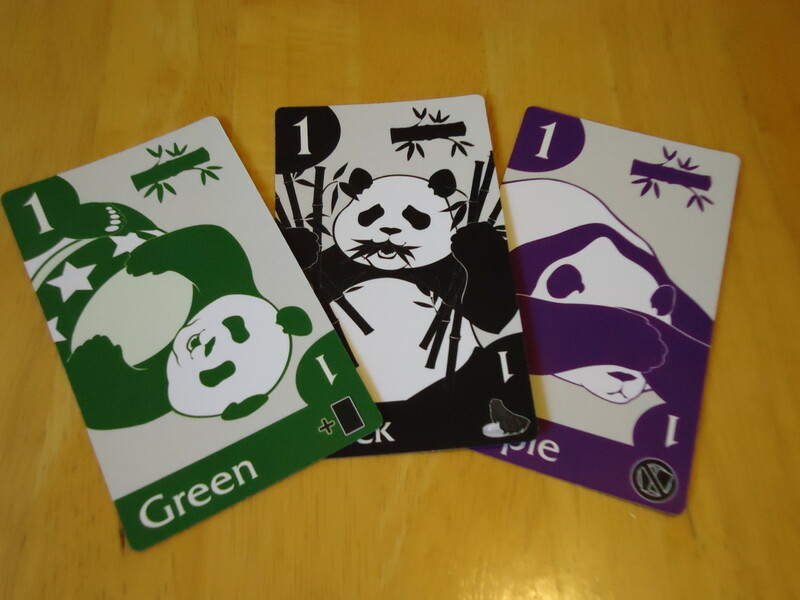 If you win a Panda Lord card, you can only take one that corresponds to the color of a card in your hand, but you may take one from the community pile (called The Glen) or steal one from another player. Each card details when and how the ability may be used. 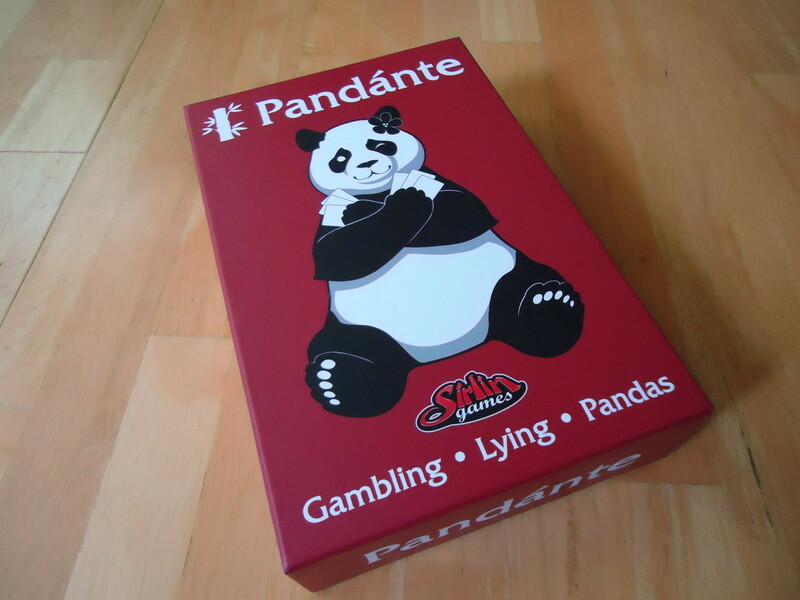 Rules are also included for playing Pandante as an ongoing gambling/tournament game (called Seriousface Gambling Mode). This version eliminates the Gold Fairy and increases the buy-in amounts. It is possible in this version to go bust and be eliminated from the game. Do Pandas Really Make Everything Better? Pandante is one case where I can say that pandas do not make everything better. This game aggravated me right off the bat. I received the “Standard” edition to review. I popped open the box and there were the cards, the rule book, the player boards, and the start player marker. But there were no chips or tokens to use for betting. This surprised me because there’s nothing on the box to indicate that you need to provide your own chips. I may be the only person in the world who doesn’t have a set of poker chips at home, so off I went to the store to get a set (after attempting to raid several other games and my piggy bank to see if I could come up with enough tokens/coins, etc. to play this game without buying something extra). Annoying, to say the least. I can understand why the publisher eliminated the chips. They wanted to keep costs down. They seem to be assuming that most people have something at home that they can use for money, so why penalize them with a higher priced game? I can respect that. But I also expect a game to be complete when I open the box, or to at the very least specify on the box that it does not contain everything needed to play so that I can make an informed buying decision. Sirlin Games does offer custom poker chips that you can buy to use with the game. They’re cute but at $60, there are much cheaper options. Cheap plastic chips work just as well. If you really want to splash out cash, then for $100, you can buy the “Deluxe Edition” of the game which includes the custom chips. 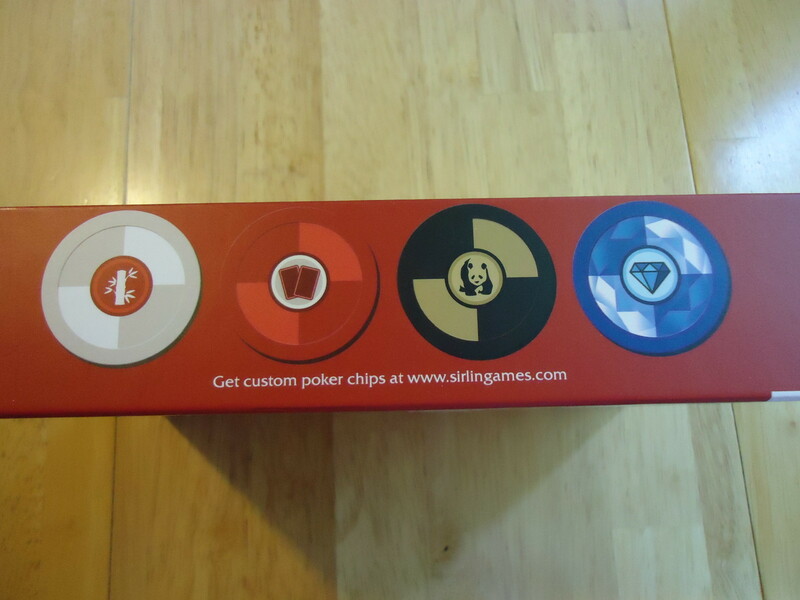 The custom poker chips you can buy to go with the game are pictured on the inside of the box. So Pandante had some big strikes against it before I even played the game. A game that cannot be played right out of the box had better be a darn good game to overcome my annoyance. So was Pandante that great? In a word, no. Pandante is trying to do too many things at once, and it does none of them spectacularly. Adequately, yes. Blow your mind great? No. It’s first and foremost a poker variant, but then it tries to add on some role selection and special abilities, as well as bluffing. Those elements overcomplicate the simple poker experience without adding much to the game. These elements aren’t integrated well enough into the game to make you feel like the role/ability/Panda Lord you’ve chosen matters in any way. You just play the ability and move on and hope no one challenges you if you lied. The only positive to the special abilities is that they provide a last ditch attempt to improve your hand or hurt your opponents. This could be accomplished more efficiently by just blind drawing an ability and skipping the challenge altogether. Additionally, if you have AP-prone players, expect to wait while they figure out which ability they want to use and whether or not they want to lie to use it. Speaking of AP, Pandante is ripe for it. Standard poker moves pretty fast. This game does not. Each phase of the gambit has decisions attached to it. What do you have in your hand? What are the community cards? What are other players betting on? Should you fold or keep going, hoping to get what you need? Should you bet on a high hand, or be conservative and bet low? Will it be worth it to pay for snacks or not? Which ability do you want to use? Do you want to lie? Do you want to challenge other players on their abilities? On and on it goes. While this amount of decision making might appeal to gamers looking for a true “gaming” experience, those who love the simplicity of poker will get annoyed fairly quickly. Even gamers may be put off by all the rule exceptions and checks that happen each turn. The lying/bluffing aspect is the most unique and interesting part of the game, but it only works if your group embraces it. If you’ve got a bunch of people who always play it straight and/or no one is willing to throw challenges, then you might as well play regular poker. Even if you do embrace the lying/challenge aspects, they add time and complexity to the game to resolve and aren’t strictly necessary to the game. Pandante is friendlier than regular poker and that is its one strength. If your hand isn’t coming together, you have other options besides folding (although you can fold if you want). You can lie, use an ability to try to get a better hand, or pay for the right to draw/discard a card. Even if things go badly, the Gold Fairy will keep you in the game by bringing you back to 20 gold. This makes Pandante ideal for those who want a friendlier game than standard poker. There is a cute game here, but it’s nothing special. It’s certainly not special enough to overcome my initial frustration with the incomplete components. 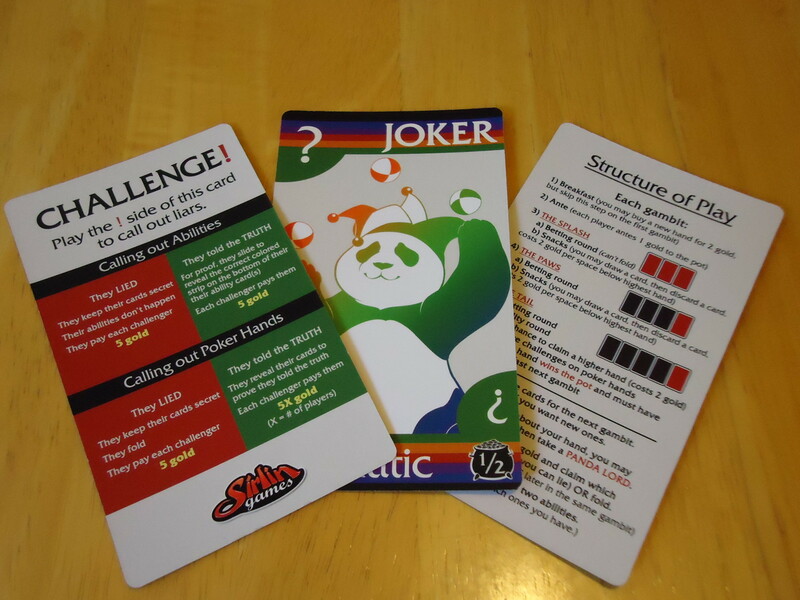 Pandante might work for those who love poker but who can’t get anyone else in their group to play regular poker. It might also work as a game to bring to a non-gamer event such as a family reunion or campout. The bright colors, special abilities, and cutesy theme might make it attractive to some who would normally shun regular card games or who think that “designer games” are too hard or boring. It might also be a good way to introduce kids to poker (if you don’t mind teaching them to gamble, that is). However, for those looking for a good poker experience, you’re better off just sticking with standard poker. 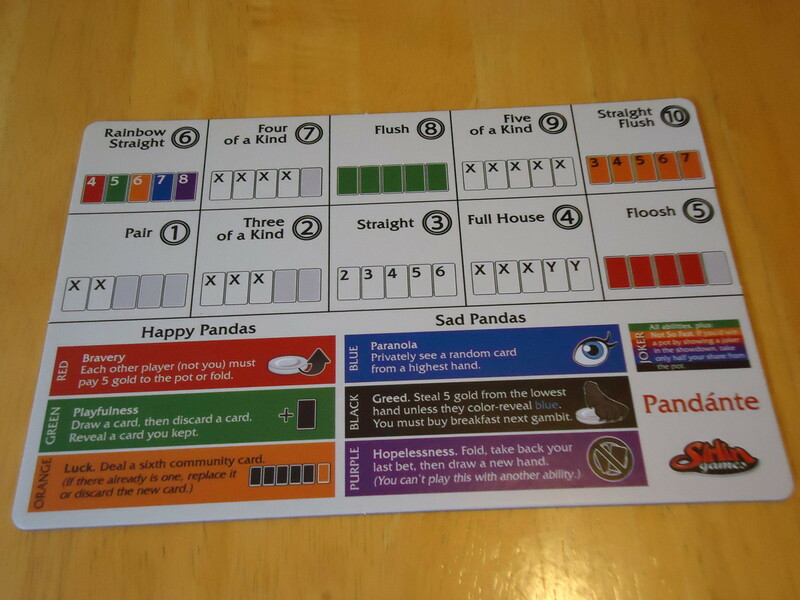 Pandante adds unnecessary complexity to what should be a relatively simple game. The special abilities, Panda Lord cards, and the Gold Fairy that essentially eliminates player elimination might be fun for some, but for me they were just cumbersome and added to the playtime and fiddliness without increasing the fun. When I want to play a game with special abilities, I’m going to look for a meatier board game. When I want to play poker, I’m going to play poker. Pandante does not figure into either scenario. For a 2-player game, you’ll need 20 chips representing 1 gold, 20 representing 2 gold, and 8 representing 5 gold. Add 8-10 more $5 chips to account for the Gold Fairy. For a 3-player game, you’ll need 30 chips representing 1 gold, 30 representing 2 gold, and 12 representing 5 gold. Add 12-16 more $5 chips to account for the Gold Fairy. For a 4-player game, you’ll need 40 chips representing 1 gold, 40 representing 2 gold, and 16 representing 5 gold. Add 16-24 more $5 chips to account for the Gold Fairy. For a 5-player game, you’ll need 50 chips representing 1 gold, 50 representing 2 gold, and 20 representing 5 gold. Add 20-32 more $5 chips to account for the Gold Fairy. For a 6-player game, you’ll need 60 chips representing 1 gold, 60 representing 2 gold, and 24 representing 5 gold. Add 24-38 more $5 chips to account for the Gold Fairy. If it makes accounting easier for you, you can optionally add a fourth denomination of chips representing $10. The number of those you need is a personal preference and I wouldn’t bother adding the extra denomination until you’ve played a few times and have a good feeling for what you’ll use. Cute, colorful artwork will draw players in, especially kids. Lying/bluffing element can add some fun and laughs if the group embraces it. Option to play in casual tabletop mode or true gambling mode gives players choices about how competitive they want to make the game. No forced player elimination in casual mode so everyone can play to the end. Incomplete components renders the game unplayable out of the box (Standard Edition). No clear explanation as to how many of each chip/money denomination you need to play at each player count. Special abilities, Panda Lords, picky rules, and challenges add time and unnecessary complexity to what should be a simple game. AP-prone players will drag down the game.